While most places are preparing for the winter chill in the fall, visitors and locals on the Isle of Palms are still kicking back and enjoying the sunshine. This is a place where you might even forget that it’s fall as you walk along the beach in your bathing suit and the ocean is still warm enough to take a dip. Isle of Palms weather in October delights and surprises guests looking for an escape before the winter season brings its cold temperatures. If you are visiting in October and want an extensive list of local tips and suggestions for things to do and see while you are on Isle of Palms, request access to our free Vacation Guide! Expect a steady dose of sunshine and temperatures in the high 70s and low 80s during the day. Sure, it gets a little chilly during an evening walk on the beach, but that’s nothing a cozy sweatshirt can’t fix. A majority of the best activities in the area focus on being outdoors, but if the occasional rain happens to fall, there are some excellent things to do indoors around town. Beach fans rejoice! The 80-degree weather in October on Isle of Palms allows you to stroll along the vast stretch of pristine beach without bundling up in the fall. Pull up a beach chair or lay down a blanket and get a tan in the middle of October. Forgot your suit? No problem! Check out some of the best shops on IOP for all of your beach essentials. Bring your fishing rod and surf fish off the beach or rent one of the best Charleston area fishing charters for a fun-filled day of fishing on the open seas. Catch anything from tarpon to sailfish to spotted seatrout in the abundant waters of the Atlantic Ocean. Check the IOP fishing report to see what people are catching in the area while you are here. Plenty of exciting and memorable activities await you on the water. Rent a boat for the whole family or zip around on a jet ski for a pulse-pounding thrill ride. If you don’t feel like leaving the beach, just hop into the ocean waves and enjoy the water. Reserve beach chairs through our guest services! Historic Downtown Charleston has so much to see and do for everyone in your family. Some of the best restaurants in the state of South Carolina feature unique Southern cuisine that is renowned around the country. History lies around every corner, whether it be a towering church, beautiful home along the Battery, or the Charleston Market. If it’s raining, head over to the South Carolina Aquarium to get up close and personal with turtles, sharks, and much more! Let the Isle of Palm’s October weather turn your clock back to warm, sunny summertime! Your luxurious and accommodating East Islands Rentals vacation home is the perfect home away from home during your fall getaway. Our guest services can help you make dinner reservations, find a babysitter for a date night, and even deliver your groceries to your front door. 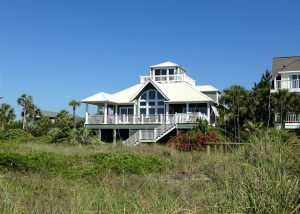 Our Bella Villa oceanfront property is the ideal destination for a family looking for a beach escape in October! This house sleeps seven and features three bedrooms and two and a half bathrooms. Gaze out across the ocean from your private deck and relax in the living room with picture windows and cathedral ceilings. The property also has a full kitchen. Check our availability and don’t forget to request your free Isle of Palms Vacation Guide to start planning your beach trip today! We can’t wait to meet you!